Draft: 2010, Atlanta Braves, 23rd rd. Evan and his wife Kimberly reside in Houston, Texas... Graduated from Bishop Lynch High School in Dallas, Texas in 2004...played for the Dallas Tigers, a Dallas-area traveling squad, where he was teammates with Clayton Kershaw...also played for a Junior Olympics team along with Billy Butler, Homer Bailey and Justin Upton...was recruited by Rice University and Texas A&M to play at the collegiate level...accepted a scholarship to Texas A&M but did not attend... Attended Seminole State College in Oklahoma in 2005, but dropped out of school in early 2006... During his time away from school and baseball, worked a number of jobs across the country, including a ski lift operator, valet, machine shop apprentice and janitor... Following a four-year hiatus from baseball, enrolled at the University of TexasPermian Basin in 2010, where he joined his stepbrother, Drew Kendrick, on the baseball team...during his only season with UTPB, earned first team All Heartland Conference honors while leading the Falcons in nearly every offensive category...batted .403 with 19 doubles, 12 homers and 62 RBI, helping to lead UTPB to a berth in the Heartland Conference Championship game... Was drafted by the Braves in the 23rd round of the 2010 draft after his resurgence at UTPB...signed by Braves scout Gerald Turner... In 2012, earned the nickname "El Oso Blanco" (The White Bear) while playing winter ball in Venezuela for Aguilas del Zulia...hit .309 with a league-leading 17 homers and 45 RBI in 52 games for Aguilas... Was acquired by Houston from Atlanta in a five-player deal prior to 2015 Spring Training...is signed to a one-year deal for the 2018 campaign...is eligible for free agency following the 2018 season. 31-year-old served as the Astros backup catcher for the second consecutive season, making 47 starts behind the plate with the Astros going 32-15 in his starts (.681)...made 29 starts at designated hitter...caught five of Houston's nine shutout wins...played in just 84 games, the fewest in a single season in his career...dealt with two stints on the DL...suffered a concussion in August that sidelined him for most of the entire month, and a right wrist injury at the beginning of September...hit 11 of his 12 homers as a catcher, giving him 30 career homers with Houston as a catcher...that ranks fifth all-time in club history behind Alan Ashby (69), Jason Castro (59), John Bateman (44) and Brad Ausmus (41)...hit .288 (53x184) with 14 doubles, 11 homers, 37 RBI and an .878 OPS (.335 OBP/.543 SLG) in his 49 games as a catcher...during his three seasons with Houston, has hit .291 (109x374) with 24 doubles, 30 HR, 78 RBI and a .936 OPS in his 104 games as a catcher...no catcher in the Majors has homered at a higher rate than Gattis since 2016...has posted a 12.47 at-bat to home run ratio (374AB/30HR) as a catcher in that span, which leads the position...ranks directly ahead of Gary Sanchez (13.00, 533AB/41HR)...surpassed Chris Carter (116 RBI, 88 R) to become the franchise leader in RBI (123) and runs (97) by a designated hitter...is also the franchise leader in games (236) and hits (208) as a DH...showed a refined approach at the plate, posting a career-low 15.4% strikeout rate (50SO/325PA)...posted a career-high 79.6% contact rate, and made contact on 88.3% of his swings on pitches in the strike zone, also a career-high mark...batted .327 (32x98) with 10 doubles, four homers, 46 RBI and a .924 OPS with runners in scoring position...posted a 1.017 OPS with runners in scoring position and two outs...made his fourth career Opening Day roster...placed on the 7-day concussion DL on Aug. 5...transferred to the 10-day DL on Aug. 13...activated from the DL on Aug. 25...placed on the 10-day DL with right wrist soreness on Aug. 31...activated from the DL on Sept. 9...failed to reach base on April 10 at SEA, snapping his streak of 19 straight starts at the catcher position where he reached base...tied the seventh-longest streak in club history by a catcher, and the longest since Tony Eusebio posted a 24-game streak during the 2000 season...drew a bases-loaded, walkoff walk on April 9 vs. KC in the 12th inning...was the ninth walkoff walk in club history, and the first since Derek Bell drew a bases-loaded walk in the 10th inning on July 17, 1999 vs. DET...Gattis reached base safely a career-high five times, drawing a career-high three walks in the contest...hit a three-run, bases-clearing pinch-hit double on April 11 at SEA...was his fourth-career hit in the pinch as an Astro...marked the second time in his career that he drove in three runs in a pinch-hit plate appearance: also June 10, 2013 at SD (three-run homer)... reached base safely in 21 straight starts from April 17-May 22...was the second-longest streak of his career (23 games in 2014) and the third-longest active streak in the Majors at the time...fell a triple shy of the cycle on May 31 at MIN, going 4x6 with a solo homer and three total RBI in a start at catcher...tied his single-game career-high for hits (last, Aug. 11, 2016 at MIN) and tied his season-high for RBI (also April 11 at SEA)...on July 1 vs. NYY, homered off RHP Dellin Betances in an Astros four-run 8th inning...Houston was down 6-3 in the game and came back to win, 7-6...was the first home run that Betances allowed in 2017...posted an 11-game hitting streak from June 19-July 9...was the second-longest streak of his career, and the second-longest active streak in the Majors at the time...ranked second in the AL in slugging percentage in July (.695), behind only Jose Altuve (.727)...batted .322 (19x59) with four doubles, six homers, 14 RBI and a 1.060 OPS in 15 games during the month...ranked fourth in the AL in July OPS...recorded the eighth multi-homer game of his career on July 18 vs. SEA...recorded the 500th hit of his career on July 31 vs. TB...made two injury rehab appearances with Double A Corpus Christi from Aug. 22-23 while recovering from his concussion...went 0x5 with 2 walks...also made two injury rehab appearances with Class A Quad Cities from Sept . 7-8, going 0x8...both games occured during the Midwest League playoffs... batted .267 (8x30) with two doubles, one homer, three RBI and an .858 OPS in 13 postseason games...made nine starts, including eight at DH and one at catcher...hit two doubles in Game 1 of the ALDS vs. BOS, marking his first career extra-base hits in the postseason...opened up the scoring in Game 7 of the ALCS vs. NYY with a solo homer off LHP CC Sabathia...was his first career postseason homer...became the fourth DH in postseason history to hit a homer in a Game 7, joining Jason Giambi (2003 ALCS), David Ortiz (2003 ALCS, 2004 ALCS) and Willy Aybar (2008 ALCS)...became the first DH to homer in the 2017 postseason for any club...singled as a pinch hitter in Game 2 of the World Series...joined Jose Vizcaino (Game 2 of the 2005 WS) as the only players in club history to record a hit in the pinch in a World Series Game...drew three walks (one intentional) in Game 3 of the World Series, becoming the second DH in World Series history to have three walks in a game, joining David Ortiz (Game 6 of the 2013 World Series). After a one-year break from catching in 2015, returned to the backstop position while splitting time at designated hitter...set a career high in homers with 32...19 of his homers came as a catcher, which became a new single season franchise record, surpassing the 16 hit by Jason Castro in 2013...along with home runs, set career highs in OPS (.826), on-base percentage (.319), slugging percentage (.508), walks (43), and stolen bases (2)...became the second Astro in a nine-season span (2007-16) with a 30-HR year (also Chris Carter, 37 in 2014)... ranked sixth in the Majors in ABs-per-HR with a 13.97 mark (min. 400 at-bats)...was the ninth highest AB/HR mark in franchise history, and highest since Carter in 2014 (13.70)...ranked third among AL catchers in HR...batted .295 (56x190) with 10 doubles, 19 HR, 41 RBI and a .992 OPS (.345 OBP/.647 SLG) in 55 games at catcher...made 55 appearances and 49 starts behind the dish...were his first games caught since 2014 with Atlanta (93 games/89 games started)...also started in 68 games as the designated hitter...caught 46.4 percent of attempting base stealers on the season (13-of-28)...ranked as the third-highest caught stealing percentage in the AL (min. 50 games caught)...ranked as the third highest caught stealing percentage by an Astros catcher in a single season in franchise history (min. 50 games caught)...batted .288 (63x219) with 19 HR, 36 RBI and a .951 OPS (.358 OBP/.594 SLG) after the All-Star Break...ranked tied for ninth in the AL in HR and sixth in OPS in that span...was the fourthhighest Post-All-Star Break OPS by an Astro since 2006, trailing only Lance Berkman (1.078 in 2006; .962 in 2007) and Luke Scott (1.047 in 2006)...started the season on the 15-day Disabled List...was recovering from sports hernia surgery that was performed on Feb. 9...was activated on April 12...was optioned to Double A Corpus Christi on May 6, where he appeared in seven games, with four starts at catcher...was recalled on May 16, and remained with the Major League club through the end of the season...in his first game back after being recalled on May 17 at CWS, provided the late inning heroics by hitting an 11th inning two-run homer...has 23 career homers in the month of May, his most of any month...since 2013 his 23 May HR rank tied for ninth among Major League hitters...tied a career-high with four hits and four RBI on June 3 vs. OAK...was his first career game with four hits and RBI...homered in three consecutive games from June 3-5, which tied a career-long streak (last accomplished from May 1-3, 2015)...recorded his first-career stolen base on July 10 vs. OAK...had been one of three players in Major League history with 12 career triples and no steals...also Russ Nixon (1957-68) and Tom Zachary (1918-36)... recorded two multi-homer games (July 23 vs. LAA and Sept. 21 at OAK)...tied with Colby Rasmus as the only Astros players with at least two multi-homer games...hit his second career walkoff homer on Aug. 26 vs. TB...broke a 4-4 tie with a solo homer to left field on what was a nine-pitch at-bat...was his first walkoff homer since April 21, 2014, while playing for Atlanta...reached base safely in 15 straight starts (from Aug. 26-Sept. 12), which was the second-longest streak of his career...his career long streak is 23 games (May 19-June 22, 2014)...hit 10 homers in September, which ranked tied for second in the AL...were the third-most homers in a single month of September in club history behind only Lance Berkman (2005) and Richard Hidalgo (2000), who share the club record (11)... ended 2016 on a season-long tying five game hitting streak (Sept. 25-Oct. 1)...batted .429 (8x20) with two homers and four RBI during the run...also had a five game run from June 24-29...started the season with the Double A Corpus Christi Hooks on rehab assignment...in four rehab games, hit .400 (6x15) with one double, two HR and four RBI...after being optioned to Double A on May 6, played in seven games with the Hooks, primarily behind the dish...batted .360 (9x25) with a double, three HR, six RBI and a 1.145 OPS (.385 OBP/.760 SLG). Led the Astros in home runs (27) and RBI (88) in what was his ﬁrst season with the club, and his third in the Majors...posted single-season career highs in games played (153, previously 108 set in 2014), runs (66), hits (139), multi-hit games (40), triples (11), homers, RBI, walks (30) and extra-base hits (58)...became the ninth player since 2000 to reach the 20-homer plateau in each of his ﬁrst three seasons in the big leagues, joining Yoenis Cespedes, Giancarlo Stanton, Evan Longoria, Jay Bruce, Ryan Braun, Dan Uggla, Mark Teixeira and Albert Pujols...ﬁnished tied for third in the Majors in triples with 11...had just one triple in his career prior to this season...prior to Gattis, the last Astro to record 11 triples in a season was Michael Bourn, who tallied 12 in 2009...became the ﬁrst player since Dale Long in 1955 to record 11 triples in a season without stealing a base...became the ﬁrst player in club history to reach 11 triples, 27 homers and 88 RBI in a single season...only three other Major League players put together seasons with those totals since 2000: Jimmy Rollins (2007), Nomar Garciaparra (2003) and Vladimir Guerrero (2000)...hit eight of his triples as the designated hitter, becoming the ﬁrst DH since Paul Molitor in 1996 to hit eight triples in a season...made 136 starts at designated hitter and 11 in left ﬁeld...ranked tied for third among designated hitters in homers (24) and ﬁfth in RBI (79)...the Astros went 37-17 (.685) in games in which he drove in a run...hit well at Minute Maid Park, batting .273 (79x289) with 15 homers, 48 RBI and an .818 OPS (.310 OBP/.509 SLG) in 78 games at home...ranked sixth among AL cleanup hitters in RBI (59)...ranked tied for ﬁfth in the AL with 27 go-ahead RBI...made his third career Opening Day roster, and his second consecutive Opening Day start...avoided a stint on the DL for the ﬁrst season of his career...homered in three straight games for the ﬁrst time in his career from May1-3...hit two homers on May 3...per Elias, joined Luis Valbuena (April 20 at SEA) as the second Astros player in a two-week span to hit two homers in a game, with one being a game-winner in the 8th inning or later...only one Astro had done that in the previous seven seasons combined: Hunter Pence on Aug. 17, 2010 at NYM...over a three-month span from April 26-July 26, was tied for the AL-lead in RBI (56) with Jose Bautista...this followed a stretch from Opening Day-April 25 in which he had recorded just one RBI...posted 54 RBI and 15 homers prior to the All-Star Break...became the ﬁrst Astros player to reach those totals prior to the All-Star Break since Lance Berkman in 2009 (18HR/55RBI)...recorded his second multi-homer game of the season, and the ﬁfth of his career on Aug. 26 at NYY...over his ﬁnal 21 games of the season, hit .303 (23x76) with three doubles, two triples, ﬁve homers, 15 RBI and a .925 OPS (.333 OBP/.592 SLG)...played in all six postseason games with Houston, starting at designated hitter...went 4x23 in the playoﬀs...was acquired from Atlanta prior to the season, along with RHP James Hoyt in exchange for RHP Mike Foltynewicz, IF Rio Ruiz and RHP Andrew Thurman on Jan. 14, 2015. Appeared on his second Opening Day roster with the Braves...set career highs in almost every offensive category: games (108), at-bats (401), hits (97), homers (22), average (.263), OBP (.317) and SLG (.493)...became the second catcher in Braves franchise history to hit 20 homers in each of his first two seasons...C Earl Williams sets the record from 1971-72...his 22 home runs ranked second among Braves hitters and second among National League catchers...ranked second on the Braves with 13 game-winning RBI, behind OF Justin Upton (14)...became only the fifth player in Braves franchise history to tally at least 38 doubles and 43 homers in each of his first two seasons with the club...the last player to do so was OF Jeff Francoeur from 2005-06 (44 2B, 43 HR)...had a career-high 20-game hitting streak from May 24-June 24...batted .386 (32x83) with eight homers and 21 RBI...the streak marked the longest by a catcher since C Ivan Rodriguez had a 24-game streak in 2004 with Detroit...batted .353 (30x85) in June which ranked sixth in the National League...clubbed five homers in 10 games from April 14-26...posted his first career four-hit game on April 16 at PHI...batted .348 (16x46) from April 11-27, raising his batting average .103 points...collected his first career triple on May 13 at SF off RHP Ryan Vogelsong...homered in his first two at-bats on May 25 vs. COL (both off LHP Franklin Morales) for his third career multi-homer game and second of the season...hit his 22nd homer, which was a game-winning, 10th inning bomb on Sept. 6 at MIA...went 3x4 in the contest...missed 10 games in September after being diagnosed with strep throat on Sept. 8 and having a kidney stone on Sept. 17...placed on the 15-day Disabled List from July 1-21 (retroactive to June 29) with a bulging thoracic disk in his back and missed 17 games...appeared in four games with Triple A Gwinnett on rehab assignment. Made an opening day roster for the first time in his career in his fourth professional season and batted .243 (86-for-354) with 21 home runs, 65 RBI in 105 games in his rookie season. Made his Major League debut on 4/3 vs. PHI. Homered to lead off the fourth inning to become the seventh player in Atlanta history to hit a home run in his MLB debut, joining Bob Horner (1978), Jermaine Dye (1996), Marty Malloy (1998), Jeff Francoeur (2005), Jordan Schafer (2009) and Jason Heyward (2010). Defensively made 91 starts, including 47 in left field, 38 at catcher, four at first base and two as the DH. Made his first career appearance on a postseason roster. He started all four games of the National League Division Series vs. LAD in left field and batted in the No. 4 spot in the lineup. Batted .357 (5-for-14) with one RBI, two walks and a .438 on-base percentage in four games during the National League Division Series vs. LAD. Through his first three games of the NLDS, was 5-for-10 (.500) with a .538 on-base percentage. Went 0-for-4 in Game 4. Became just the ninth rookie in Braves history to hit 20 homers in a season. Is only the seventh rookie in club history to hit at least 20 doubles and 20 homers. Despite making just 91 starts (played in 105 total games), led all Major League rookies in RBI (65) and GW-RBI (11), and ranked second in home runs (21). Drilled a pinch-home run in 4/18's eighth inning in his first career pinch-hit at-bat. According to the Elias Sports Bureau, Gattis became the first rookie to homer in his first career pinch-hit plate appearance since Yasmani Grandal hit a pinch-home run on 7/4/12. Claimed back-to-back National League Rookie of the Month honors in April and May, becoming the first player to win back-to-back NL Rookie of the month honors since teammate Jason Heyward (2010, April and May). In April, led MLB rookies in home runs (6), RBI (16), and slugging percentage (.566) and hit .250 (19-for-76) with five game-winning RBI. In 22 May games (.303), led all rookies with 16 RBI while his six home runs tied for first. Finished in the top 10 among National League rookies in slugging percentage (3rd, .480), extra-base hits (4th, 42), total bases (5th, 170), doubles (6th, 21), runs (7th, 44), and outfield assists (10th, 3). Went 6-for-10 (.600) with five extra-base hits and four runs scored in 13 plate appearances as a pinch-hitter. Drilled his fourth career pinch-hit home run in just his eighth career pinch at-bat on 6/10 at SD. The franchise mark for pinch home runs in a season is five (Butch Nieman, 1945). Through his first 43 career at-bats, recorded five home runs to become the first rookie to record at least five homers in his first 43 career at-bats since three players did so in 2008 (Taylor Teagarden, Matt Joyce and Chris Davis). Posted his first career multi-homer game on 9/8 at PHI with both shots coming off of Cole Hamels. Place on the disabled list on 6/18 with a right oblique strain. Activated off the DL on 7/14 after playing two rehabilitation games (.125, 1-for-8) at Gwinnett (AAA). Over his last 11 games of the season, since 9/18 on, batted .302 (13-for-43) with four extra-base hits and six RBI. In his last six games, went 10-for-24 (.417) with a 1.065 OPS. Went just 5-for-36 (.139) in 13 August games. Was optioned to Triple-A Gwinnett on 8/31 and went 6-for-13 (.462) with three doubles, one home run and a .500 on-base percentage over a three-game stint. Recalled by Atlanta on 9/3. Clubbed his first career grand slam (10th career home run) with two outs (3-0 count) in the fourth inning on 5/22 off MIN's Vance Worley. Smacked his third pinch-home run on 5/21 vs. MIN with a game-tying solo shot in the ninth inning. According to the Elias Sports Bureau, he became the fifth rookie in Atlanta Braves history to hit a game-tying or go-ahead home run in the ninth inning or later as a pinch-hitter joining Jim Breazeale (1972), Ryan Klesko (1993 and 1994), Steve Sisco (2000) and Brooks Conrad (2010). Made his first career start in left field on 5/6 at CIN (1-for-4, 1 2B, 1 RBI, 1 E). His first career start at first base came on 4/12 at WSH (0-for-4, 1 BB, 1 E). Homered in five of the first six ballparks he played in. Entered 2013 as the Braves' eighth-best prospect according to Baseball America...Began the season with Lynchburg (High-A), batting .385 (30-for-78) with nine home runs and 29 RBI before being promoted to Mississippi (Double-A) on 5/1...Missed more than two months (5/20-7/24) after straining tendons in his left wrist....Appeared in four games (rehabilitation assignment) for the GCL Braves from 7/25-28 before returning to Mississippi on 7/29...For the season, batted .305 (83-for-272) with 20 doubles, 18 home runs and 67 RBI ... Ranked third in the organization in home runs and fifth in RBI, despite only playing a total of 74 games...Set career-highs with five hits and six RBI in a 13-2 win at Potomac on 4/15...Named the Carolina League Player of the Week (4/5-15) after hitting .469 (15-for-32) with three home runs and 14 RBI...Hit .349 (30-for-86) with runners in scoring position...Appeared in 53 games for the Aguilas del Zulia of the Venezuelan Winter League, batting .303 (59-for-195) with a league-high 16 home runs and 44 RBI. In just his second professional season, clubbed 22 home runs and plated 71 runs while leading the South Atlantic League in batting average at .322 (109-for-338) in 88 games for Single-A Rome...Claimed Rome Braves Player of the Year honors after leading the Class A team in home runs (22), RBI (71), and OPS (.986) and ranked second in BAvg. (.322), third in OBP (.386), and placed fourth in doubles (24)...Twice earned South Atlantic League Player of the Week honors, for the week ending 7/24 and 8/14...Selected to the South Atlantic League postseason All-Star team...Honored by Braves organization as the Rome July Player of the Month (.253, 25-for-99, 7 HR, 24 RBI)...Posted a 12-game hitting streak and a 12-game RBI-streak, 8/13-24. Hit .478 (22-for-46) with 19 RBI...Had two 10-game hitting streaks, 5/10-30 (.,486, 18-for-37) and 7/15-26 (.410, 16-for-39)...Logged three two-homer games, 7/22, 7/23 and 8/15...Hit .430 (34-for-79) with 10 HR against LHPs compared to .290 (75-for-259) with 12 HR vs. RHPs. Selected by the Braves organization as the June Player of the Month for Danville after logging a .385 batting average with four doubles. 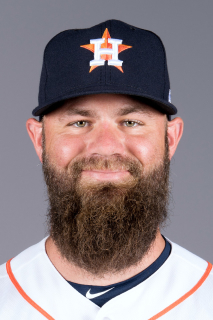 October 29, 2018 C Evan Gattis elected free agency. September 9, 2017 Houston Astros activated C Evan Gattis from the 10-day disabled list. September 5, 2017 Houston Astros sent C Evan Gattis on a rehab assignment to Quad Cities River Bandits. August 25, 2017 Houston Astros activated C Evan Gattis from the 10-day disabled list. August 22, 2017 Houston Astros sent C Evan Gattis on a rehab assignment to Corpus Christi Hooks. August 13, 2017 Houston Astros placed C Evan Gattis on the 10-day disabled list. Concussion. August 5, 2017 Houston Astros placed C Evan Gattis on the 7-day disabled list. Concussion. May 17, 2016 Houston Astros recalled C Evan Gattis from Corpus Christi Hooks. May 7, 2016 Houston Astros optioned C Evan Gattis to Corpus Christi Hooks. April 12, 2016 Evan Gattis roster status changed by Houston Astros. April 7, 2016 Houston Astros sent C Evan Gattis on a rehab assignment to Corpus Christi Hooks. July 21, 2014 Atlanta Braves activated C Evan Gattis from the 15-day disabled list. July 17, 2014 Atlanta Braves sent C Evan Gattis on a rehab assignment to Gwinnett Braves. September 3, 2013 Atlanta Braves recalled C Evan Gattis from Gwinnett Braves. August 31, 2013 Atlanta Braves optioned Evan Gattis to Gwinnett Braves. July 14, 2013 Evan Gattis roster status changed by Atlanta Braves. July 12, 2013 Atlanta Braves sent C Evan Gattis on a rehab assignment to Gwinnett Braves. June 18, 2013 Atlanta Braves placed C Evan Gattis on the 15-day disabled list. Strained right oblique. March 31, 2013 Atlanta Braves selected the contract of C Evan Gattis from Mississippi Braves. March 30, 2013 Evan Gattis assigned to Gwinnett Braves. January 10, 2013 Atlanta Braves invited non-roster C Evan Gattis to spring training. October 8, 2012 DH Evan Gattis assigned to Aguilas del Zulia. July 25, 2012 C Evan Gattis assigned to GCL Braves. May 21, 2012 Mississippi Braves placed C Evan Gattis on the 7-day disabled list. May 1, 2012 C Evan Gattis assigned to Mississippi Braves from Lynchburg Hillcats. March 29, 2012 Evan Gattis assigned to Lynchburg Hillcats from Rome Braves. February 2, 2012 Atlanta Braves invited non-roster C Evan Gattis to spring training. September 22, 2011 Evan Gattis roster status changed by Rome Braves. May 4, 2011 C Evan Gattis assigned to Rome Braves from Danville Braves. June 11, 2010 Evan Gattis assigned to Danville Braves from Atlanta Braves. June 10, 2010 Atlanta Braves signed C Evan Gattis.